If you live in one of the member chapters, please contact the President of the Chapter. Please download the application and mail. Please download the Associate application and mail. MaCCRA is a statewide nonprofit association of residents living in Continuing Care Retirement Communities, MaCCRA is your voice at the Capital and protects resident rights by monitoring and advocating legislation. 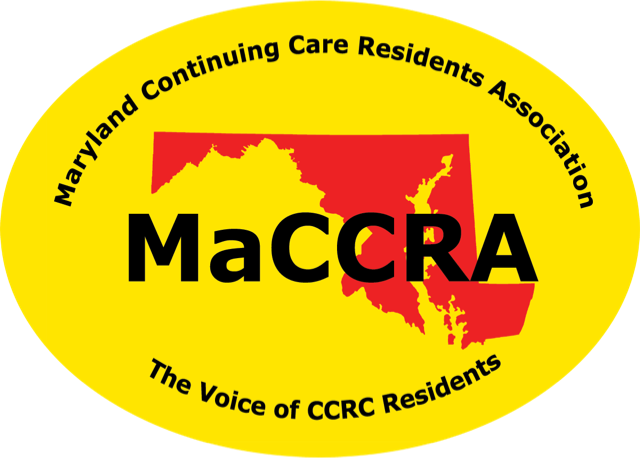 There are 18 MaCCRA chapters currently represent more than 12,051 residents. Former CCRC residents, family members, and friends who support MaCCRA objectives are invited to join MaCCRA as Associate members. Membership is only $20 per year for an individual and $30 for a couple. This nominal amount of money delivers an invaluable sense of community and assurance that you are supporting the organization that speaks for you. Join MaCCRA today and make your voice heard by the Maryland legislative and regulatory agencies.